The Pine Mountain Trail is located in west central Georgia approximately 80 miles southwest of Atlanta on US highway 27. The western terminus of the trail is the FDR Park entrance on GA Highway 190 across from the Callaway Gardens Country Store. The eastern terminus of the trail is near the WJSP-TV Tower located on GA Highway 85W. The FDR State Park office is at 2970 Ga. Highway 190, Pine Mountain, GA 31822. It is located just off I-185 near Callaway Gardens, west of Warm Springs on Ga. Route 190, or south of Pine Mountain off U.S. Hwy. 27. The main information phone number for the park office is 706-663-4858. Google Maps, Yahoo! 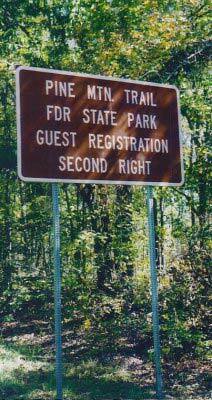 Maps, MapQuest or any of the online mapping services can assist you in finding FDR State Park. Take Exit 2 just after crossing into Georgia on I-85. Exit 2 is for Georgia 18…..Go right (east) on Ga. 18 for 17.1 miles (you will cross over I-185) and be near Pine Mountain, Georgia when you see Callaway Gardens on your right. Ga 18 and Ga 354 come together right in front of Callaway Gardens. Go straight on Ga 354 now for another 3.9 miles till you see a ramp off 354 and signs for Ga. 190. If you go under a stone bridge, you have gone too far! Turn right onto Ga. 190 and the FDR State Park office is just .4 down Ga. 190 (it is a big stone house looking building on the left). There are two parking areas for the office, one on the left of the building which is a loop and the other smaller area on the right. Last chance for fast food and groceries is at Exit 79 in Alabama (Lanett exit) take a right off the exit ramp for several fast food places. There is also a Walmart Superstore with groceries 5 minutes away going the same direction. GeorgiaBest coming from Atlanta or coming from Columbus off I-185. Exit 34 off I-I85 is for Georgia 18…..Go (east) toward Pine Mountain on Ga. 18 for 6.7 miles and be near Pine Mountain, Georgia when you see Callaway Gardens on your right. Travel south of Atlanta from I-285 onto I-85 south toward Montgomery for 47.3 miles and Exit 21 for I-I85 toward Columbus/Fort Benning. You will only be on I-185 a few miles to Exit 42 and US 27 south (5.9 miles from the start of the off ramp off I-85 to the off ramp at Exit 42). Take a left at the end of the Exit 42 off ramp and head toward Pine Mountain. Pass through Pine Mountain on US 27 south to a red light at SR 354 (this is 10.5 miles from I-185). Take a left onto SR 354. Stay on Ga 354 now for another 2.6 miles till you see a ramp off 354 to your right and signs for Ga. 190. If you go under a stone bridge, you have gone too far! Turn right onto Ga. 190 and the FDR State Park office is just .4 mile down Ga. 190 (it is a big stone house looking building on the left). There are two parking areas for the office, one on the left of the building which is a loop and another smaller area on the right. Last good chance for fast food and groceries is at Exit 47 off I-85 and Newnan take a left off the exit ramp for several fast food places. There is also a Walmart Superstore with groceries going the same direction off to the right. From the I-475/ US 80 intersection, you will travel on US 80 west out of Macon till Talbotton (some 53.4 miles) and turn right (north) onto 41, pass through Woodland on 41 and come to the stop sign at US 27A (about 13.6 miles). Turn right onto US 27A and only go about .4 mile as Ga. 190 will be on your left. You will come to a stop sign about 7.3 miles along at the intersection of Ga 85 near the WJSP-TV tower area. Go straight and continue on 190 for another 8.9 miles and the FDR Park office. You will know you are getting close to it as you will go over a stone bridge which goes over Ga 354. The park office is some .4 mile past the bridge on your left on Ga. 190. FloridaComing out of Florida on 1-75 north. Keep on I-75 to Exit 142 and go west toward Fort Valley on HWY 96 (from this exit point it is about another 80 miles to the park office). Stay on Hwy 96 west for about 40 miles then turn North (right) onto Hwy 41 toward Talbotton- Woodland. Stay on 41 through both towns till 41 ends at a STOP sign. Turn RIGHT onto 27 ALT and go only .4 mile. TURN west onto GA 190. A few miles along you will come to a STOP sign intersection, crossing ATL 85....keep going straight west. About 9 miles further down on GA 190 is the FDR State Park office on the LEFT (big stone building). Park in the larger parking lot on the LEFT side of the building. NOTE: in Fort Valley are several fast food places like McDonalds. There is also a nice grocery store near the McDonalds on Hwy 96. After that, there are no places to shop/eat or such till you reach FDR State Park or Pine Mountain.